Cornelius (Corney) Cole Smith, Sr. received the Medal of Honor for Valor during the Indian Wars in 1891 for “distinguished and conspicuous bravery in action”. At age 21, Cornelius was a Corporal in K Troop 6th Cavalry when he charged a group of hostile Sioux Indians at Little Grass Creek, South Dakota. Corney broke up an attack on a small group of U.S. Cavalry Troops, driving the Sioux from the bluffs they held. He rose to the rank of Colonel and served in Cuba during the Spanish American War. He fought in the jungles of Mindanao during the Philippine Insurrection and in World War I. Later Corney served as military attache in Columbia and Venezuela. He taught at the University of Arizona and served as a technical advisor for military films in Hollywood. Upon retirement from the military, Smith moved his family to Riverside in 1930. He purchased the historic Victorian Charles E. Packard House, built in 1890 on Jurupa Ave. The house remained in the Smith family until 1963, when his son Cornelius Smith Jr., sold it. Corney’s second wife was Kathleen Crowley Smith. She was the daughter of a congressional representative from New York. Their daughter Alice Smith Randolph had a beautiful voice and often sang at the Mission Inn. 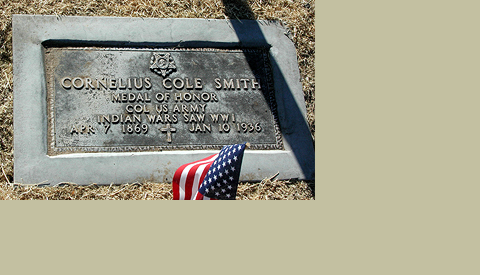 Cornelius Smith, Jr., also enjoyed a military career and was officer of the day in the Marine barracks during the Pearl Harbor attack. Corney’s other son was James Graham Smith. All are buried at Evergreen.